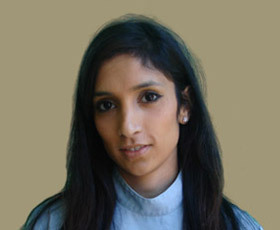 Heena graduated from the Barts and the London School of Medicine and Dentistry and has worked at Croydon Dental Care since. She is an enthusiastic and dynamic member of of dental team whose goals are to provide excellent dental care for the whole family. Her particular passion is to secure the oral health of her patients by providing excellence in hygiene and periodontal care. In addition, she has attended a significant number of post-graduate events to further her knowledge and skills in cosmetic dentistry and tooth whitening. Heena enjoys restoring teeth to their natural state and so uses tooth coloured crowns and fillings to do so. Heena has often played a vital role in relieving and managing anxiety of patients who are often nervous and unsettled. Her kind, nurtured approach and pain relief dentistry (oral sedation) has restored back confidence in patients. In her spare time she loves travelling and shopping.